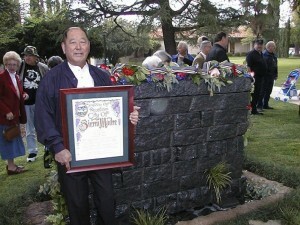 Reprinted from SierraMadreWeekly.com – A Celebration of Life for Lew Watanabe will be held at Sierra Madre Elementary School auditorium on Thursday, June 30, at 1:30 p.m., followed by a reception at The Japanese Garden on the school grounds. The graveside service at Sierra Madre Pioneer Cemetery will be held that morning at 11:30 a.m. In lieu of flowers, please make a contribution to Lew’s Japanese Garden Memorial Fund. A Gofundme account has been set up with monies raised to go to the maintenance and upkeep of the garden. Donations can be made by clicking here.